OXFORD, Miss. 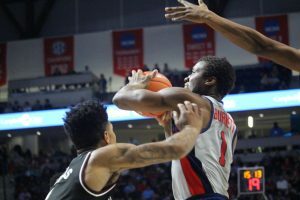 – A win over in-state rival Mississippi State was just what Ole Miss needed after close losses last week to A&M and No. 5 Baylor. A 27-point win was even better. You’d have to go back to 1951 — when Harry Truman was President of the United States — to find a more lop-sided Rebels victory over the Bulldogs. Ole Miss (13-9, 4-5 Southeastern Conference) used a 12-0 run in the second half to pull away from and defeat Mississippi State, 88-61. Ole Miss has won six of the last seven in the series, and the Rebels are now 83-43 against Mississippi State (13-8, 4-5) in games played in Oxford. Four Rebels scored in double figures in the win. Terence Davis led Ole Miss with 18 points. Sebastian Saiz finished with 17 points and 11 rebounds, which marks his 15th double-double of the season, 24th of his career. Deandre Burnett tallied 16, while Rasheed Brooks scored 15. Mississippi State trailed for most of the game, and looked to close its deficit to single digits in the early minutes of the second half. Lamar Peters drained a 3 to cut the Bulldogs’ deficit to 10 at 64-54. However, the Rebels’ 12-0 run soon put the game away for good. “Got to give them credit. That’s a very good team,” said Bulldogs head coach Ben Howland. Justas Furmanavicius scored a layup to start the double-digit run. Burnett and Brooks each made two shots apiece from the foul line. Davis added a 3, then Saiz followed with a layup to create breathing room for the Rebels. Although Saiz is usually the player to whom Ole Miss looks for scoring, the Rebels’ solid ball movement against Mississippi State gave others a chance to put points on the scoreboard. Take Brooks for example. He came in tonight averaging 7.6 points per game, but had 13 points at halftime to help the Rebels take a 51-33 lead at the half. Both teams traded scores for the first 10 minutes of the first half, but Ole Miss took charge the rest of the way. The Rebels used an 11-2 run to take a 40-30 lead at the 4:09 mark of the first half. Then five points from Brooks, plus a layup from Burnett pushed Ole Miss’ lead to 45-30. Saiz and Burnett added two 3s before halftime to bring the team’s 3-point total to five out of 14 tries. Brooks made three of the Rebels’ five from long range. The Rebels had 15 assists on 30 made baskets, committing only eight turnovers. As for Mississippi State, its two best scorers – Quinndary Weatherspoon and Peters – struggled when Ole Miss went on its scoring run to take a double-digit lead. Neither player could find a shot, and they had a combined six turnovers. Weatherspoon and Peters finished with 16 points each. As a whole, the Bulldogs committed 19 turnovers, which led to 23 points for the Rebels. 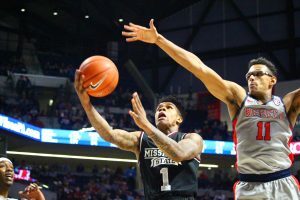 The Rebels were outrebounded in their last two games against Texas A&M and Baylor, but against Mississippi State, Ole Miss finished with a 43-30 advantage. The Rebels outscored the Bulldogs 44-28 in the post. Ole Miss is 9-5 at home this season (2-3 in conference play). 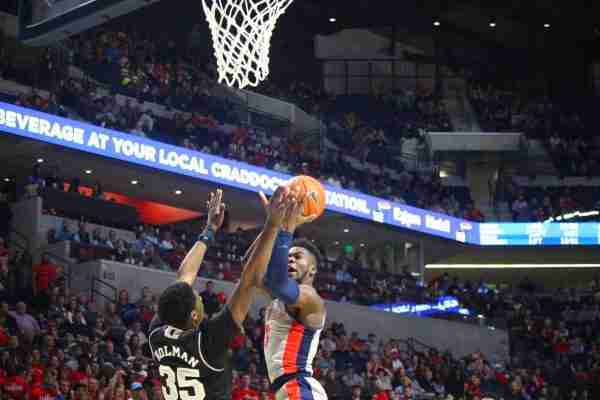 The Bulldogs lost four of their last five SEC games, after starting conference play 3-1. Senior guard I.J. Ready didn’t play because of an injury to his tibia. Howland mentioned Ready had an MRI and is getting better. The injury took place in a warm-up practice session. Peters was injured in the second half as he was going up for a layup. Howland said it was a hip pointer injury. Ole Miss travels to Vanderbilt on Saturday (2:00 p.m., ESPNU). Mississippi State hosts Tennessee on Saturday (2:30 p.m., SECN).